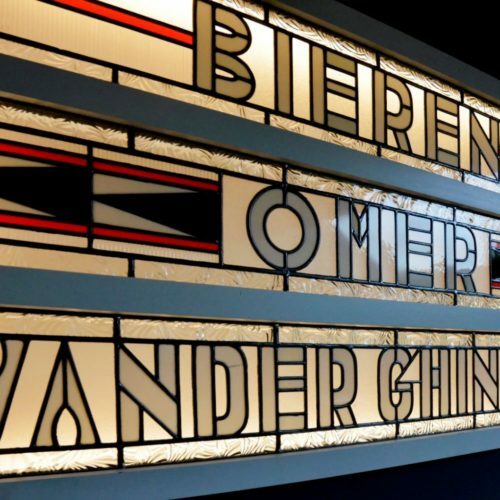 The Brouwerij Omer Vander Ghinste just celebrated 125 years of brewing in Bellegem, Belgium. Founded in 1892 by Omer Vander Ghinste, he named the brewery after himself and even included it in the stained glass windows in his pub. Since changing stained glass is expensive, he names his son Omer also, and the brewery has never been renamed after five generations of Vander Ghinste operation. Cuvee Des Jacobins Rouge is a traditional Flemish sour ale that begins by cooling overnight in a large, shallow coolship then spontaneously ferments by the wild yeast and bacteria in the night air. The deep red ale showcases a balanced dance of sweet malt and sharp acidty. The 5.5% ale is aged in large oak foudres for at least 18 months. Flanders Red is indigenous to the Dutch-speaking region of West Flanders on the Belgium-Netherlands border, and its best known example is Rodenbach. The “Burgundy of Belgium” is more like wine than beer and pours a deep red color. This red wine-like beer is sour and fruity and with a tannic, dry finish. The tart acetic acid reminds one of vinegar but should be restrained and not overly vinegar-like, and the fruit should be prominent.